I recently was able to locate a metal sign that I wanted to hang on my wall. 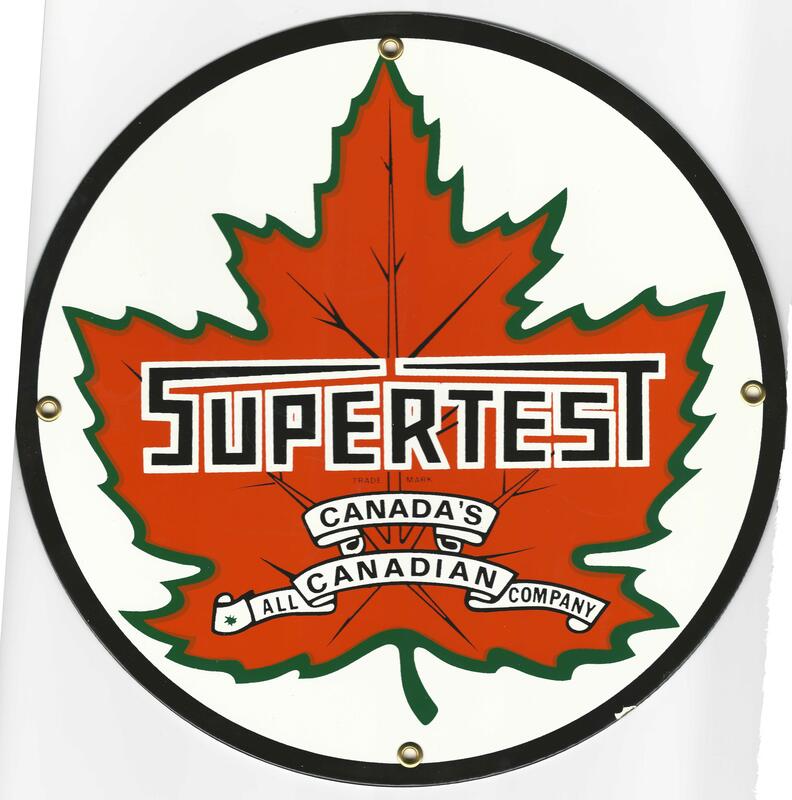 It was a “Supertest” sign, from a former gasoline chain in Canada, mostly in Ontario and Quebec. The sign is shown below. I was born on a farm in Shelburne, Ontario at the intersection of Highways 10, 24, and 89. On that corner, which was known locally as “Wrigglesworth’s”, was a Supertest gas station run by the Wrigglesworth family. When my Dad and I were working in the field and Dad felt like a treat, we went over the Wrigglesworth’s and had an Orange Crush, or a ginger ale, such as Pure Spring, Wilson’s, or Canada Dry. Supertest was never a big chain, but they became somewhat famous as the sponsors, and owners I think, of the racing hydroplane, the “Miss Supertest” series. There were a total of three Miss Supertests – Miss Supertest I, II, and III. Miss Supertest won a major boat race in Detroit and then won the Harmsworth Trophy in 1959, 1960, and 1961. She was the first non-USA boat to win the Harmsworth Trophy and the first to win it three times in a row. The boat was never beaten in any race. At one time, it was the fastest propeller powered boat in the world. I can remember lining up to get a close look at her when she was on display at the Canadian National Exhibition in Toronto. What a boat! Beautiful wood, sleek design, and a huge engine. I can’t remember what kind of engine it had, but it was powerful! I remember that the driver’s name was Bob Hayward. His name was written on the boat in white letters. Miss Supertest made quite an impression on a little boy. Supertest eventually disappeared in the 1970s, as it became part of the British Petroleum corporate world. I moved away from Shelburne, the Wrigglesworth family died and/or moved away. The corner has now become yet another characterless corner with a standard gas station, a pizza joint, and the local Beer Store. However, I think the Wrigglesworths would be pleased that beer can now be bought at that location. This entry was posted in Uncategorized and tagged Supertest. Bookmark the permalink.